The Castle of Mey (formerly Barrogill Castle) is located in Caithness, on the north coast of Scotland, about 6 miles (9.7 km) west of the village of John o' Groats. In fine weather there are views from the castle north to the Orkney Islands. 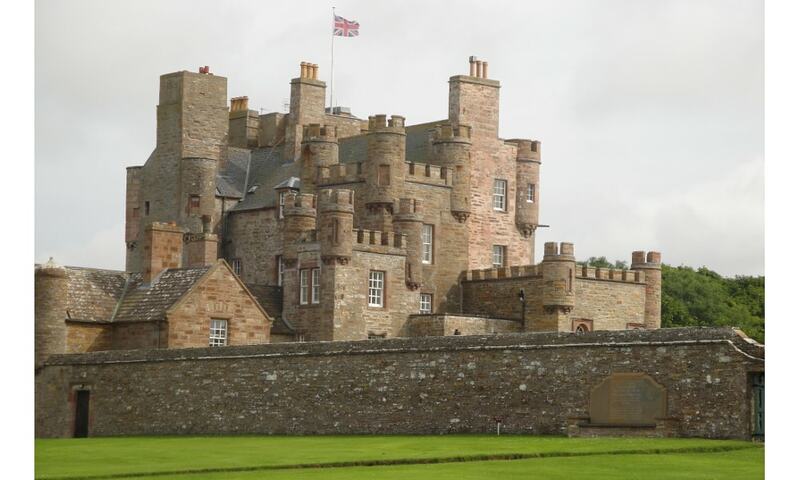 The Castle of Mey was built between 1566 and 1572, by George Sinclair, 4th Earl of Caithness. Originally a Z-plan tower house of three storeys, it had a projecting wing at the south-east, and a square tower at the north-west. The Castle's name was changed to Barrogill, and the structure was extended several times, in the 17th and 18th centuries. In 1952, the estate were purchased by Queen Elizabeth The Queen Mother, the widow of King George VI, who had died earlier in the year. The Queen Mother set about restoring the castle for use as a holiday home, removing some of the 19th-century additions, and reinstating the Castle's original name. She regularly visited it in August and October from 1955 until her death in March 2002; the last visit was in October 2001. In July 1996, The Queen Mother made the property, the policies, and the farm over to the Queen Elizabeth Castle of Mey Trust, which has opened the castle and garden to the public regularly since her death.